The VisualMedia project’s user needs roadshow began at Setanta Sports. Work commenced on 4th February 2016 at Setanta Sports in Dublin, Ireland. Where the Norwegian University of Science and Technology’s (NTNU) researchers obtained a first set of user requirements towards the VisualMedia product from Setanta Sports. Setanta Sports is an international sports broadcaster in Ireland. They specialise in broadcasting live sports events to Europe, Asia, Africa, and the Americas. Live sports broadcasting has very different operational and technical demands compared to news or pre-recorded shows. These specific requirements for live sports shows were gathered during a one-day workshop. At the Dublin headquarters of Setanta Sports, members of the production team took part in a focus-group interview. During the interview, their specific requirements and current limitations for using social media within broadcasting live sports were discussed. Mark Pilkington, Head of Transmission and Operations, envisioned the future of VisualMedia together with their producers, graphics operator, and social media manager. In addition, the NTNU experts looked at how social media and second screen offerimgs are currently used at Setanta Sports, then looked at how they may be used once the project is implemented. VisualMedia project, led by Brainstorm Multimedia, is about integrating social media, innovative 3D graphics and new interaction systems in the broadcasting industry. Six different user partners are involved in the development at different stages of the project. Setanta Sports is one of the user partners. The Norwegian University of Science and Technology (NTNU) is carrying out the user requirements research and end product evaluation in the VisualMedia project. Focus group interviews at users’ sites is one of the tools used. The project has received funding from the European Union’s Horizon 2020 research and innovation programme under grant agreement No 687800. Figure 1. 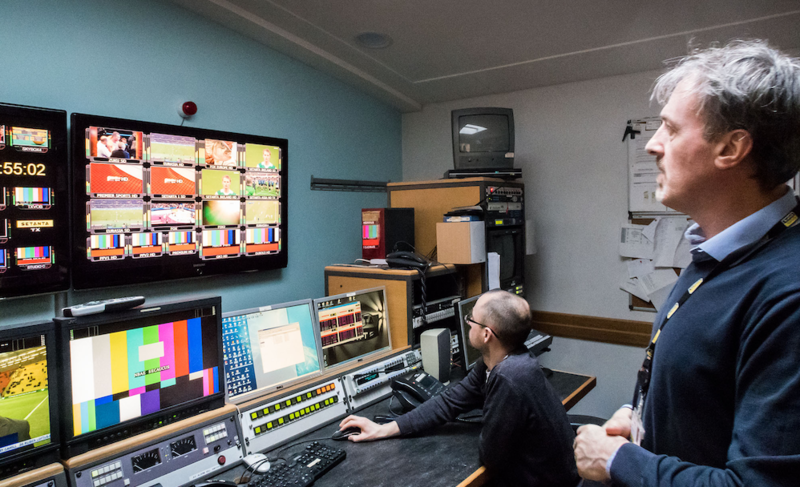 Mark Pilkington, Head of Transmission and Operations, at the main control room of Setanta Sports.